Check out the results of a recent demand response participant survey. This article is the second in a four-part series about demand response. USGBC and the Environmental Defense Fund (EDF) launched the Demand Response Partnership Program (DRPP) to raise awareness and drive adoption of demand response (DR) in commercial buildings through outreach, research and education. DRPP was supported by two utility sponsors—Southern California Edison and NV Energy—and two technology sponsors: MelRok and Enerliance. Following an outreach campaign of emails and phone calls to LEED-registered projects, DRPP received over 200 survey responses from buildings participating in or contemplating participating in DR globally. We followed up with 20 building owners and facility managers in California with experience participating in demand response to learn more about their motivations, concerns and expectations. Although improved energy efficiency and lower utility bills were the biggest motivators, many respondents also cited environmental impacts and corporate image as key reasons for participating in demand response (Figure 1). We asked participants about their top concerns before, during and after participation. The top concern before participation was the expected costs and savings. However, once projects committed to participating, the top concern became occupant comfort (Figure 2). During participation, the top concerns were operational, as facility managers sought to balance the duration of the event and the intensity of the load shed with occupant comfort. 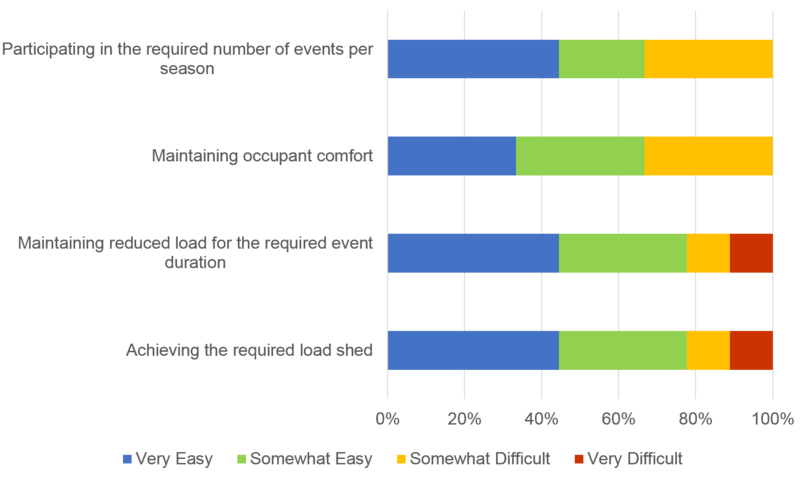 During participation, the majority of respondents found that achieving the operational requirements of demand response (number of events per season, event duration and load shed) was somewhat easy or easy (Figure 3). The majority of respondents also said that cost savings from DR participation met expectations or exceeded them (67 percent and 11 percent, respectively) and that they could achieve the necessary load shed for the event duration with only minor impacts on occupant comfort (45 percent), or even none at all (33 percent) (Figures 4 and 5). 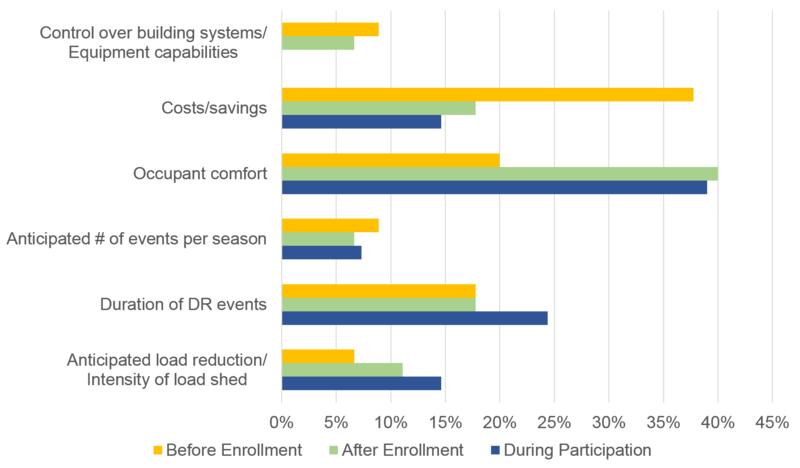 However, 22 percent of respondents said cost savings did not meet expectations, and 22 percent of respondents indicated that participating in demand response had major impacts on occupant comfort.